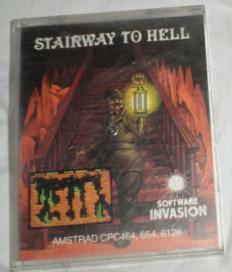 I must confess that my heart sank as I was handed this copy of Stairway to Hell from Power House to review. The cover illustration depicts Our Hero, bearing more than a passing resemblance to Indiana Jones the morning after 15 pints of Grimble's Old Sock Rotter, fleeing in horror from what appears to be a pair of highly agitated, red flannel Long Johns hanging on a washing line. Although fleeing from dubious underwear would seem to be a perfectly reasonable reaction, it is not the kind of behaviour you would normally expect from the macho-hero stereotype. As I waited for the tape to load, my mind reeled. Was this the shape of things to come, the beginning of a trend? Is underwear about to do for computer games what martial arts, laser beams and mighty warlocks have done before? Are we about to see a string of titles like Corset Killers, Jack the Stripper or The Y-fronts that ate Balham? Fortunately for my sanity, at this point the tape finished loading and I was soon able to discover that the pulp magazine-style cover does less than justice to the game inside. 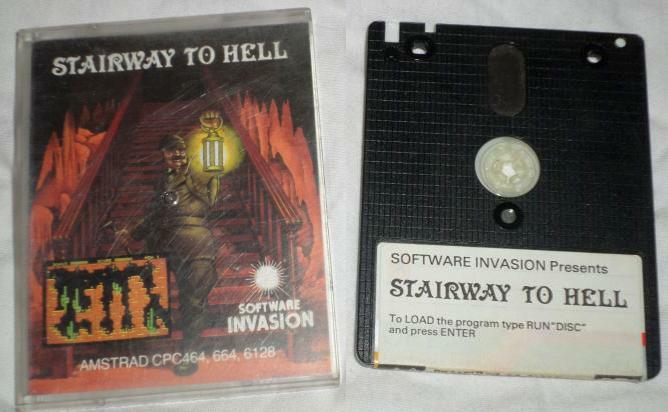 Stairway to Hell consists of 15 screens, each representing a cavern en route to the Earth's core. The object of the game is to collect the treasure available in each of the caverns. A nice touch, all but the last screen can be accessed for practice by using the left and right cursor keys. The controls are simple - although the presence of a suicide button puzzled me for a while - and are used to move Our Hero through each cavern avoiding the various nasties as he goes. And that, quite simply, is that. Simple though it sounds, this game has a lot to offer. The settings are many and varied. An old mine working gives way to a surreal factory, complete with vast, thrusting pistons; barren snowcables lead on to steamy jungles filled with exoctic plants and giant whirring inseats : an underwater vista is the forerunner of a scene st raight out of Dante's Inferno - dancin^skeletons amid fire-belching craters. The graphical realisation of each of these scenes is excellent and is enhanced by the imaginative sound effects. Each screen poses a new set of problems; obstacles to be overcome and dangers to be avoided. Some are more obvious than others, although a good deal of thought is required on each occasion. For example, it was only after becoming trapped in a jungle pit without being able to move in any direction that I discovered the reason for the suicide button - a drastic measure, but obviously a necessary one. The nasties come in various guises, each terminating one of Our Hero's five lives by causing him to explode quite dramatically. Once these problems have been figured out, however, all that is required is a bit of manual dexterity and a deal of persistence. That said, there are plenty of challenges in this game and it is likely to hold your attention for some time. One minor niggle. I was unable to find a way of saving a game. This is awkward in that all the screens have to be completed to succeed. It would be helpful to be able to store a partially-completed game. 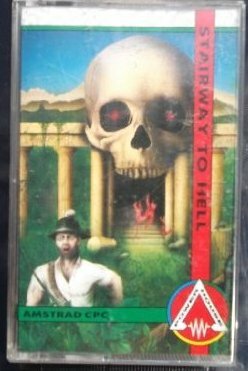 I found Stairway to Hell intriguing rather than wildly exciting - the kind of game that would appeal to those who enjoy a puzzle rather than the all action shoot-'em-up. I doubt whether it is destined to become a classic, but it is well worth investing in if you enjoy a more considered mode of entertainment or if your joystick fingers are beginning to stiffen with age and overuse. » Topic: Cheats, pokes ou solution pour "Stairway to Hell"